One of the longest standing debates in copywriting and marketing circles is over what’s better — long or short copy. The group following the short copy gospel says that people don’t like to read, especially in the modern age, so there’s no reason to write long copy. They believe that long sales letters and web pages will get ignored and never be read. Instead, it’s better to use pictures and graphics to get customers’ attention. The long copy adherents, on the other hand, believe that copy is the secret to any sales success. More copy to them means more sales. These are both generalizations, but they summarize succinctly the two different schools of copy length. So who’s right? In a way, both are because in some instances long copy is much, much better, and, in others, short copy is better. The only way to know for sure is to test the response rate your copy receives to see which converts at a higher rate — long or short copy. I’ve tested long and short marketing copy with many different companies and brands, and I have noticed one thing that seems to be a common trend. When a brand is well-known, it doesn’t need as much marketing copy as a new brand does. 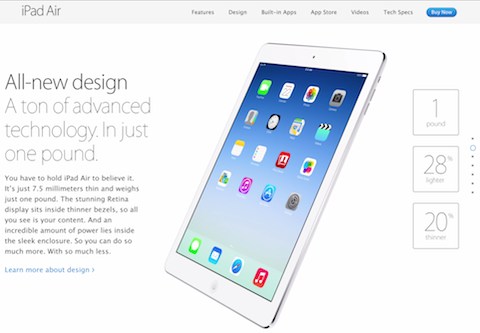 For example, you already know what an iPad is. You are either going to buy it or you won’t. Hence, Apple can create short marketing messages like the one below and still make billions of dollars. And what I found to be even more interesting is that brands with high net promoter scores (a high score means people love your product or service) can get away with even more concise marketing. Just look at WordPress. People already know all about the company, and they love the product. For this reason, it can have concise marketing copy and still have a high conversion rate. But when people don’t know much about your brand, you’ll have to create marketing copy that is longer. The reason for that is that when people aren’t familiar with your brand, they tend to have more questions and concerns. Through longer marketing copy, you can answer these objections. As a general rule of thumb, if your brand is less than 3 years old, you’ll find that you’ll need longer marketing copy. You can find out what objections to answer within your copy by using Qualaroo on your site. And as time goes on, you can continually make your marketing message more concise. The caveat to this rule is that if you are offering something for free, concise marketing typically converts better, no matter how new or old your brand is. And if you are selling something that is very expensive and considered an infrequent purchase, you’ll typically need longer marketing copy whether your brand is new or old. The good news is that there are some rules of thumb you can follow. These rules provide guidelines to indicate when it may be better to write longer or shorter copy. The first rule of thumb is to always write as much as you need to write but no more. Does a point need to be made in order to convince people to buy your product? If yes, then be sure to add it to your copy. Will another section make your copy more persuasive? Then by all means make sure that section is added to your page as well. Some points only serve to make your copy longer and don’t strengthen your argument. Those are the ones you want to leave out. Others make your copy too long and end up talking prospects out of a purchase instead of helping them to buy. Those should be left out as well. When you’re writing copy, remember to write it as long as it needs to be in order to make a persuasive presentation, but not to make it so long that your readers get put to sleep and go on to do something else. You should always test the response rates for your copy (at least whenever possible) Sometimes, a sales letter will be the most effective, and other times, a postcard is the way to go. Sometimes a long e-mail is best, and sometimes a concise e-mail is much better. It’s really difficult to know without measuring the response rate your copy achieves, but no matter what, you always want to write however much copy needs to be written in order to increase sales. The next point to keep in mind is that long copy allows you to answer more objections. The company may not seem trustworthy so customers decide not to buy. The product may seem too expensive, and the customer may feel like he can’t afford it. Customers may not understand the product and walk away out of confusion. Whatever the case, there’s a long list of objections for every product. Customers aren’t ready to buy for one reason or another. As a copywriter, your job is to identify these objections and help get the prospect over the fence. This is where long copy can help. One of the most important benefits of long copy is that it allows you to answer more objections which eventually can lead to more sales. The Crazy Egg homepage provides an example of this. 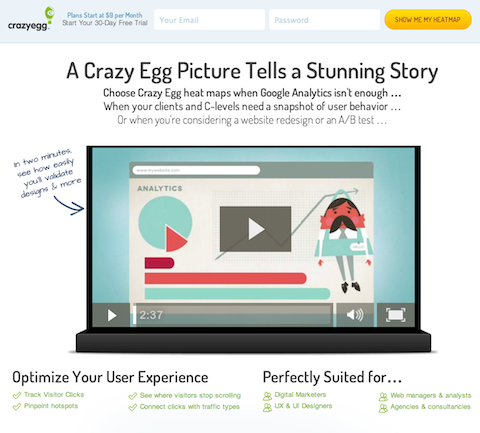 Conversion Rate Experts worked on improving conversions at Crazy Egg and ended up making the home page around 20 times longer by adding more copy than was originally included. The result? Conversion rates increased by 30%. The short copy school would say this is impossible because people don’t read anymore, but the long copy school would say it obviously worked because the longer copy allowed Crazy Egg to answer more objections. In this particular case, the long copy school wins. Why did the longer copy version work so much better? We showed how Crazy Egg stacked up against Google Analytics and Clicktale because our visitors would continually ask us about that. We provided testimonials and a list of companies who used Crazy Egg because visitors wanted to feel we are a company they can trust. We provided results of a college study on our homepage to show the value of the product we were selling because our visitors wanted to know why they should buy our product. We answered all of the objections and concerns above in our long marketing copy variation, which is why we saw the 30% increase. But that doesn’t mean you can’t make your marketing message concise and still boost your conversions. We decided to run a test in which we would remove the fluff and make our marketing copy more concise. We didn’t try to tell any stories; instead, we got to the point explaining what Crazy Egg is and why you should sign up for it. The new homepage was roughly 60% shorter in length, and it still answered the major concerns and objections visitors had. The end result was a 13% increase in conversion rate. As with anything, there are two sides to the copy coin, and sometimes, short copy is better. Generally speaking, longer copy is best for technical products that need a lot of explanation and for higher value items. In the first case, longer copy is needed so customers understand the product and learn why they need it. In the second case, longer copy is helpful to provide more reasons why customers should make a more expensive purchase. These are two examples where long copy comes in handy. But sometimes short copy is better, or at the very least necessary. Take a postcard as an example. There’s only so much you can write on a card since the space is limited. In cases like this, it’s the copywriter’s job to condense the copy into the most effective short form to get the message across and convince prospects to take action. In other instances, short copy just ends up working better. There are tests that show long copy works better for some pages, and there are tests that show short copy outperforming longer versions. Sometimes copywriters fall in love with their own writing too much and need to be shown that a shorter version works better. It’s possible that more copy would help this page perform better, but it’s also possible that in this instance less copy is better. The question to ask is whether there’s enough information provided to convince people to take action. If yes, then more copy isn’t needed and could possibly distract people from taking action. With this kind of offer, more copy would likely just get in the way. People for the most part know how the offer works and don’t need to be convinced to take advantage of an opportunity to save 50% to 90%. It’s also easier to ask people to hand over their e-mail for discounts than it is to convince them to pay $100 per month for a service. There’s always the outside chance that more copy would increase conversion rates for this page (only testing provides the answer), but it’s more likely that this type of offer doesn’t need as much copy as a site like Crazy Egg where a technical service is being sold. It’s easier to sell an offer where people receive free discounts than it is to convince people to pay for a service. So sometimes long copy is better, but sometimes it gets in the way and distracts customers from taking action when they’re ready to make a purchase already. Last week, I tested out a similar strategy with Kimberly Snyder. I took her long marketing message and shortened it. For the visitors who wanted more information on her product, we created a video that explained what she has to offer. This way if you are too lazy to read, you can get the information you need by watching and listening. So far, the test results are looking good: her conversion rate is up by just over 40%. Start your video by stating what your company does. Explain the problem you are solving. Show off the features of your product or service or explain why it is so great. Tell people to sign up or buy. Answer any major objections potential customers may have. Use proof elements to seal the deal such as testimonials. If an article or ad is interesting and well written, people will stop what they’re doing and read. Take your own reading habits as an example. What type of articles or books do you read? Do you read blog posts or ebooks? What about feature articles in Inc. or Entrepreneur? No matter what your tastes are, it’s likely that you read content in some form or another. And in most instances, you’d be surprised how much people read, even if it’s just blog posts or news articles on Yahoo.com. Imagine you’re sitting at a doctor’s office waiting to be called in and start looking at the different magazine options available on the end table next to you. You lean over and begin thumbing through the stack, flipping past copies of Newsweek and Car & Driver, looking for something interesting. Ah ha! Fast Company, something worth checking out. Then you start skimming the headlines looking for something to read. You eventually find an article titled “Instagram’s Formula for App Success.” Your interest is piqued so you flip over and read as quickly as you can through the lengthy, 5,000 word feature article. Just when you finish, the nurse comes out and says it’s your turn. You put the magazine down and go in to see the doctor. Did you notice what happened in this story? You skipped past magazines and articles that weren’t interesting to you until you found something that caught your eye. Then you took the time to read a lengthy, well written article on a topic you enjoyed. This happens all the time. We read articles that are interesting and ignore others that are not. The same is true with books, sales copy, or whatever else might come our way. If we visit a website that’s relevant to what we do, we’ll stop, investigate, and read all of the copy if it’s interesting and useful enough. If it’s not, we’ll go on our way and find something else to read. So the argument that people don’t read simply isn’t true. What is true is that people don’t read things that aren’t interesting to them — whether that’s a magazine article or an ad. If something’s interesting and written well, people will read it; if it’s a topic that doesn’t matter to them, they won’t read it. It’s as simple as that. This is something you should take into consideration when deciding how long your copy should be, and you should remember that you’re not writing for everyone. It’s ok if 90% of people don’t read your long copy. You’re not writing it for them. You’re writing it for the 10% of people who are interested in what you have to write about. If they’re interested in the product you’re selling, they’ll devour your copy looking for more information on the subject. So when you’re writing, don’t buy into the misconception that people don’t read. Instead, remember that they do, as long as it’s something that’s of interest to them. People are tired of reading salesy marketing copy that is full of fluff. Try using a concise marketing message as it typically will save your visitors time and will boost your conversion rate. Here are a few points that you should keep in mind. Long copy is often better than short because it allows you to answer more of your customers’ objections. Short copy is sometimes necessary because of the nature and size of the medium you’re using. Short copy can also be better if customers will be convinced with less copy and more words will only distract them from the offer at hand. Consider testing video as not everyone enjoys reading long copy. Get to the point by showing people what you are offering, how it works, and how it will solve their problems. If you’re writing copy for a website, you have room to write as you’d like. You can intersperse calls to action throughout the text and don’t have to worry too much about dragging on and not giving customers an opportunity to respond. But if you’re writing a sales letter, you’ll need to be more judicious with your copy since you’ll be limited to the amount that will fit on one page.